In a successful attempt to establish peaceful and improve trade relations between India and Morocco, a chamber of commerce was launched in Rabat, capital of Morocco on 31st May 2016. The India–Morocco Chamber of Commerce and Industry (IMCCI) was introduced by Vice President of India Hamid Ansari and Moroccan Prime Minister Abdelilah Benkirane. Esteemed members and officials from both the countries were present at the event. The motto of this launch was ““Shake hands, strengthen ties, go with IMCCI” which clearly reflected the need of a mutually beneficial commercial relationship between the two countries. IMCCI is supposed to work as a facilitator and active promoter of investments in, and trade ties between India and Morocco. Both Ansari and Benkirane admitted that due to globalization it is important to create joint ventures for better trade and peaceful relations between the countries. Hamid Ansari remarked in this light that, “It is a testament to the growing importance of commercial engagement between our two countries”. An official spokesperson also informed that Indian companies have cumulatively invested more than $320 million in Morocco, including in the flagship project, the Indo-Maroc Phosphore SA joint venture. These large investments show that Morocco is a favorable destination among Indian investors. Hence, this launch will result in flourishing business and will also deepen the bilateral relations. Apart from trade, India and Morocco also signed five Memorandums of Understanding (MoUs) covering various issues related to culture, media and education such as television broadcasting, water resources, institutional cooperation and educational and cultural exchanges. 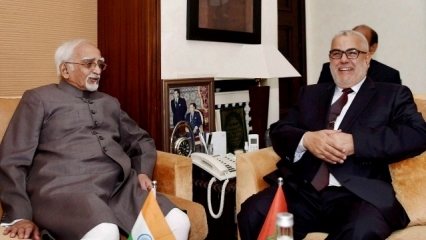 Mr. Ansari, who became the first Indian Vice President to visit Morocco in the last fifty years, was on a three-day visit. He also visited the Mohammed VI Imam Training Centre and interacted with Imams and intellectuals. This centre is known to propagate the beliefs of moderate Islam and works on its ideologies and values. With these steps, India and Morocco are certainly forging ahead to strengthen their international ties for improving the economic as well as political position on a global level.